We now move on to the second funding stream in General State Aid, the Supplemental Low‐Income (Poverty) Grant. Don’t worry, we won’t have nearly as much math as was in the last post. Supplemental Nutrition Assistance Program (SNAP, or Food Stamps). “The amount paid per low‐income pupil increases as the percentage of students in a district who are classified as low‐income increases. Districts with less than 15% of their pupils qualifying as low‐income receive $355 per pupil. All others receive a grant amount that varies based on the following formula: ((% of Low‐Income Students)[squared] x $2,700 + $294.25) ( I didn’t say there wouldn’t be any math. Blame EFAB, not me). The state’s expenditure for Poverty Grants has increased from 10% of the GSA formula in FY 2000 to more than a third in FY 2012, a 431% increase. That’s because the definition of “poverty” was changed in 2004 to sweep more people up into its definition. Prior to FY 2004, Poverty Grants were awarded based on Census data of low income students. However in FY 2004 the Illinois Department of Human Services began determining the number of low income students using the programs mentioned above. In that time, while Average Daily Attendance (ADA) remained stable, students identified as poverty students have more than doubled. Also, as the low‐income student population has grown, the total student population statewide has declined. 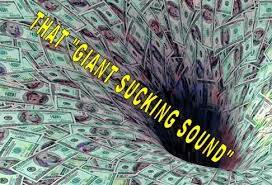 In real dollars during that time the Poverty Grants increasing from $295 million to almost $1.6 billion. This is where we bring in Chicago, as promised in the last post, because the game is rigged. 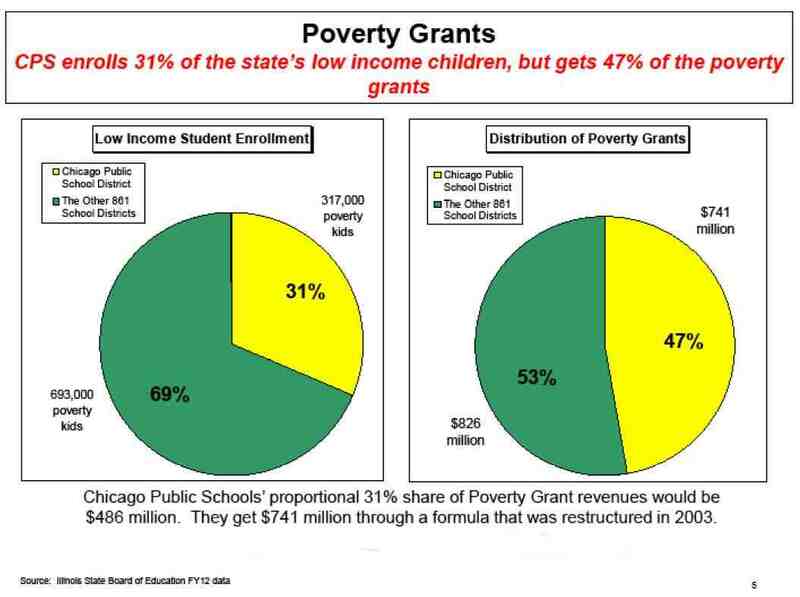 If the Poverty Grant was based on something other than concentration of impoverished students, you’d expect there to be a pretty wide distribution of grants throughout the state, and nobody would complain by saying that a kid in Harvard is being short-shrifted by a kid in Chicago. However, this is Illinois and things don’t work that way. Remember that curvilinear formula that we discussed above? That formula dramatically rewards high poverty concentration school districts, like the Chicago Public School system for having a high percentage of impoverished students. There are only so many dollars to go around, and a disproportionate percentage of them go to Chicago. Impoverished kids in McHenry County are just as poor and just as entitled to aid as an impoverished kid in Chicago. While it’s reasonable to assume that a school district with a lower percentage of its students living in poverty doesn’t face the same challenges as a school district with 90% of its students living in poverty, how does one justify that level of disparity? The Poverty Grant program has created a big sucking sound circling the drain that is the Chicago school system. NEXT: PTELL and why it’s not your friend. This entry was posted in Education, Property Taxes and tagged Chicago Public Schools, Education Funding, Illinois State Board of Education, Poverty. Bookmark the permalink.